In the wake of the devastating fire in Paris, many are coming together to donate to Notre Dame’s rebuilding. In Milwaukee, Saint Stanislaus Church has been under restoration since 2012. While it’s a much smaller project, it could give some insight to the steps of rebuilding Notre Dame. Father Benoit Jayr is a priest at St. Stanislaus. “We started with the restoration of the structure of the church," Jayr said. "It’s not very visible, heating, electricity, air conditioning." Now the changes are more visible. “Every month there’s a rotation of three pews leaving the church,” Jayr said. Pews aren’t the only things heading out. Many of the stained glass windows are going to Conrad Schmitt Studios. 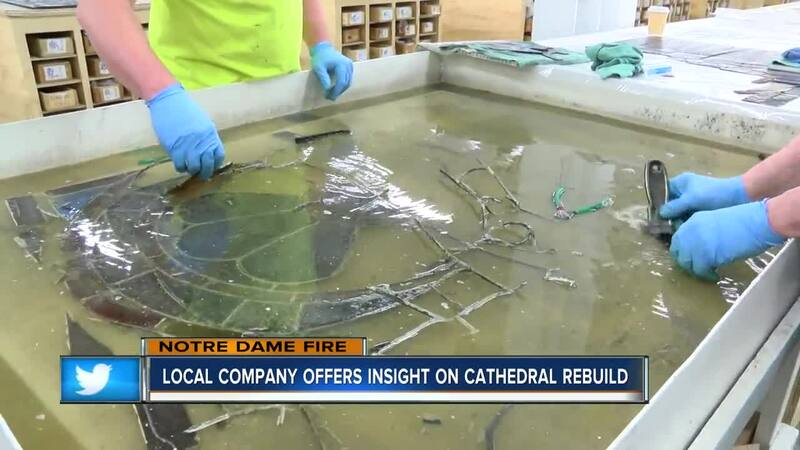 The New Berlin Company restores historic buildings and artwork daily, so it has an idea of the long road ahead for Notre Dame’s rebuilding. Heidi Emery works at Conrad Schmitt Studios. “Everything needs to be evaluated and just the cleanup and working to get it all rebuilt,” Emery said. From the drawing board to this finished product, restoring St. Stanislaus Church is a delicate process. “With the heat of the fire it may look OK, but sometimes the glass can be deteriorated,” Emery said. When it comes to rebuilding Notre Dame, it's already accomplished the first big step. “They’ve got so much support not only from their community but from around the world to rebuild the special place,” Emery said.